Antelope Zodiac Gold/Voltikus review | What Hi-Fi? "What is it?" is the first question anyone asks when first confronted by the brick-shaped Zodiac Gold. The answer isn't straightforward. In hi-fi we're used to products fitting neatly into conventional categories; this Antelope doesn't quite do that. At its heart the Zodiac Gold is a digital-to-analogue converter. It's the top model of three that the company currently makes. Here, we're testing it with the optional outboard power supply called, rather colourfully, Voltikus. As standard it sounds pretty good, and if that's all you heard you'd probably be more than happy. Nevertheless, spending the extra for a Voltikus really does pay dividends. This compact unit delivers a purer, more stable power feed to the Zodiac Gold, helping it deliver a more convincing sound. The Zodiac Gold remains a smooth and subtle performer, but there are notable gains in detail resolution, sound staging and dynamic expression with the premium power supply option. Once the scale of the improvements is heard we doubt whether anyone would stick to the standard set-up. 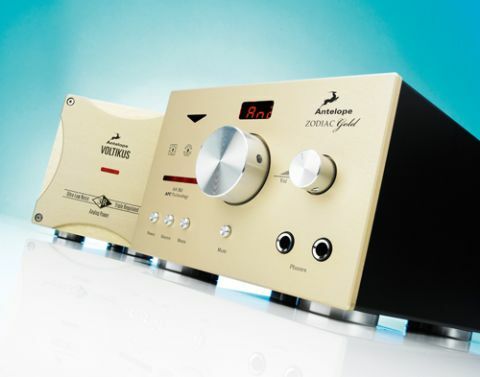 More than just a DAC, the Zodiac Gold is a fully featured preamp too. It's a small box, and every bit of the rear panel is covered with sockets. There are balanced and single-ended analogue connections along with a comprehensive collection of digital inputs and outputs. Inputs are selected by toggling through the options via the source button. This could prove cumbersome but, cleverly, the Zodiac Gold auto-senses the connections in use, so redundant inputs are ignored – neat. At the front there's a pair of full-sized headphone outputs with a dedicated volume control. Headphone outputs are usually an afterthought on products such as this, but here they sound as good as the line-level output. Unusually for a high-end stereo unit, Antelope has a control PC/Mac app for this DAC too. It's nicely done and sends commands via the USB connection. Neither the Zodiac Gold nor the Voltikus is a particularly hefty unit for its size, but they feel nicely made. We really like the remote too, it's a solid, simple all-metal unit that's a pleasure to use. That's more than can be said for most of the handsets we see in the Temptations section of our magazine. That said, we think the main control knobs could feel more substantial, and we're sure the loud clicking sound the volume control circuitry makes as the level is changed will irritate some. Smaller gaps between volume steps at lower volumes would be nice too; it was hard to get exactly the right loudness when listening quietly. Once given the best part of a week to settle down, this Antelope combination impresses. From cold, the impression is of excess richness in the bass, but this slowly fades to leave a pleasingly refined and balanced sound. If you're the kind of person who thinks all digital products sound hard and aggressive, this pairing will make you think again. It sounds pure, clean and unforced. Despite a crisp presentation and a high level of resolution, the Zodiac Gold always delivers fluid and engaging results. Listen to a 24Bit/192kHz rendition of Beethoven's Piano Concerto No.3 through the USB input and the sheer scale of the stereo imaging is the first thing that impresses. The sound staging is unusually wide, nicely layered and beautifully focused. If you enjoy pinpointing the exact position of instruments in a recording, the Zodiac Gold is a fine choice.There's loads of fine detail on offer and it's presented in a natural, rounded manner, and with real delicacy. Move onto Kate Bush's 50 Words For Snow and the good news continues. Her distinctive voice is delivered with passion and is rich with texture. There's no shortage of agility either. It's only when playing something like Jay-Z's Blueprint 3 that weaknesses arise. Music such as this needs rock-solid punch and precise rhythmic timing to work. The Zodiac Gold doesn't quite deliver. It favours the delicate over the dynamite, so fails to communicate that final degree of excitement, robbing this fine product of the fifth star. The story is remarkably similar through the analogue line-level inputs. There's enough transparency to make good use of high quality sources, but not quite the absolute authority to truly convince with all types of music. The Zodiac Gold/Voltikus combo is immensely capable, and has the kind of sonic balance that makes long-term listening easy. We can't think of a rival that matches its range of features. It's not quite an all-rounder but remains a proposition to be taken seriously.